Yumma Yumma: Lunch at a grocery store?? I can't believe its been a whole week since I've posted! Its been a pretty busy week though...hubby (I mean, Superking) and I had to juggle one vehicle for a couple days, I went to a baby shower for a friend in which I was working feverishly at the last minute to finish a sewing project for her, and I've been getting ready to host a church get-together at my house for my sister-in-law. ANYWAY...back to food. I'm a little back-blogged right now, as in, I have a bunch of food stories I've been wanting to share but got so many at once that I had to spread them out. So this little story I'm sharing today actually took place in late December. We have a trendy-steadily-growing grocery store around here called Wegman's. The one closest to us in Sterling is nice and really big but the one in Leesburg (about 15 minutes away) is even bigger and nicer. There's a section of the store which I call the Market Area. 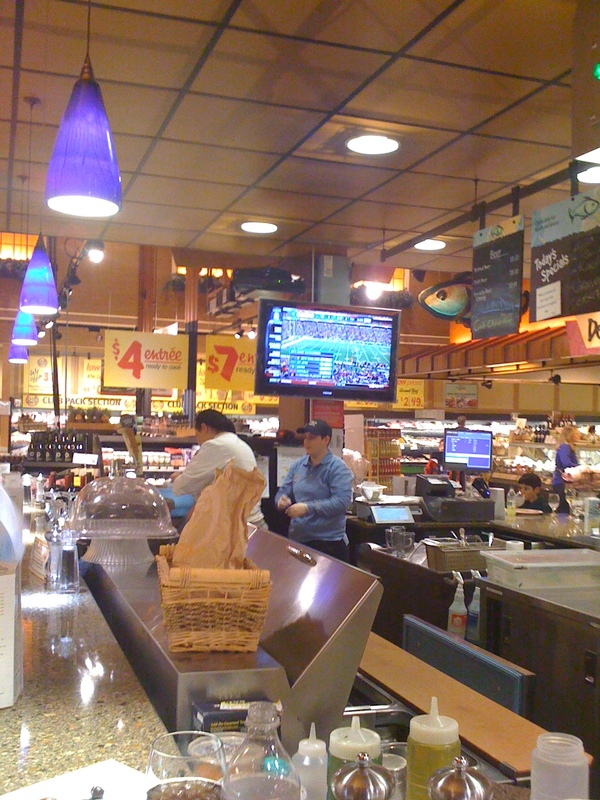 This area houses the deli, the bakery, the seafood counter, etc. (My favorite spot is the cheese shop...its like cheese heaven!) But they also have a food bar set up and a section where you can get made-to-order food like sandwiches or tacos or pizza, kind of like a little fast-food restaurant. The Leesburg store actually has its own little cafe/bar in the middle of their market area. You might think..cafe in a grocery store? How good could it be? produce section...ooh fancy wooden crates! 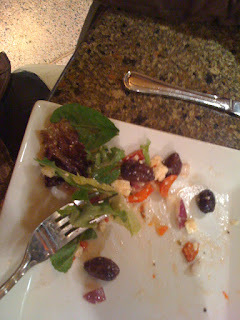 But actually its fairly gourmet and really yummy food! Superking ordered a salad with arugula and spinach, goat cheese, walnuts, olives, red peppers, red onions, and tomato, with a vinagrette dressing. Very light and crisp, a little tart, a little savory. 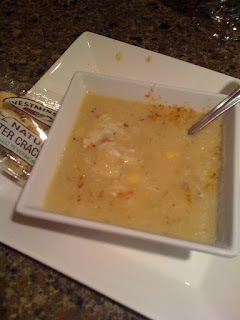 I had the corn and crab chowder. Very creamy and chunky and warm, full of crab meat and veggies, with a touch of Old Bay. Perfect for a cold winter day. 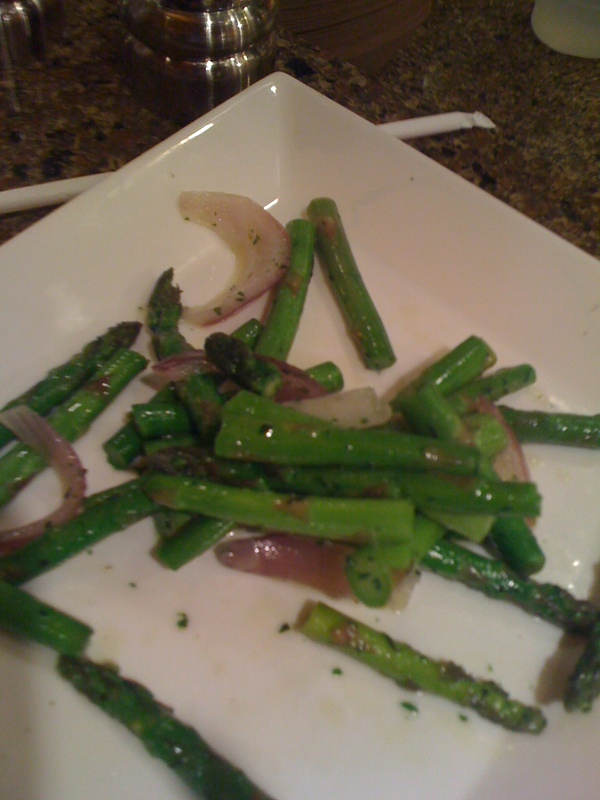 Then we split a steak and cheese sandwich that was served with grilled asparagus and red onions. 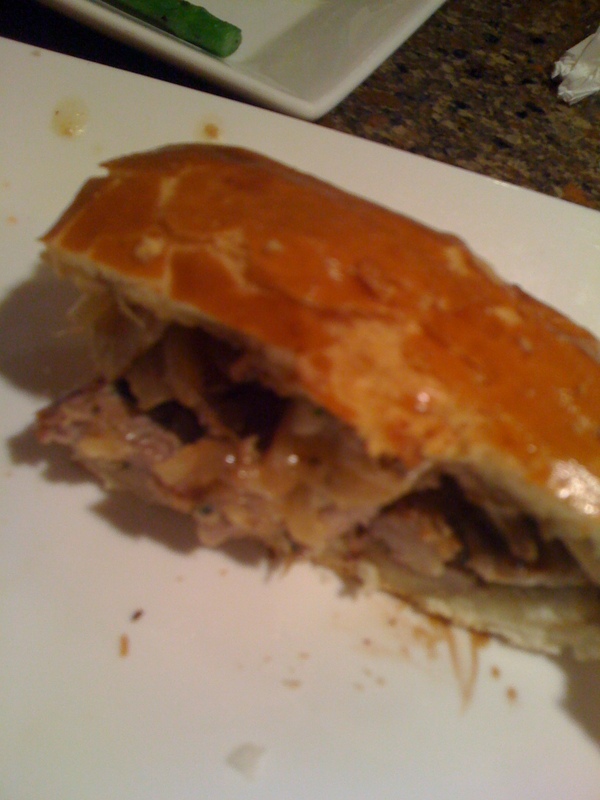 The sandwich was great...nice melted provolone cheese with thick juicy steak pieces on a soft toasted roll. The asparagus (which I really like) was perfectly crisp-tender, lightly grilled and sauteed in a little butter with the onions. Yummy, crispy, buttery perfection. And a great compliment to the sandwich. Who would've thought you could get such great gourmet food cooked for you at a grocery store?? You should try it! It's totally Yumma Yumma!